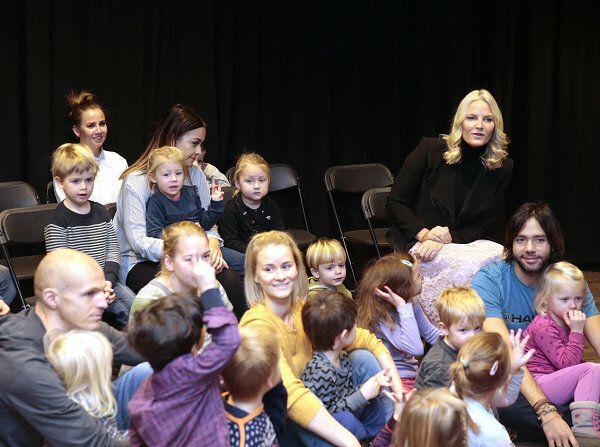 On November 30, 2016, Crown Princess Mette-Marit of Norway visited Deichman Public Library, Majorstuen Branch (Deichmanske bibliotek) in Oslo, Norway. Majorstuen is the largest Deichman library branch in Oslo, and offers automated lending of books, audio books, comics, movies and music. 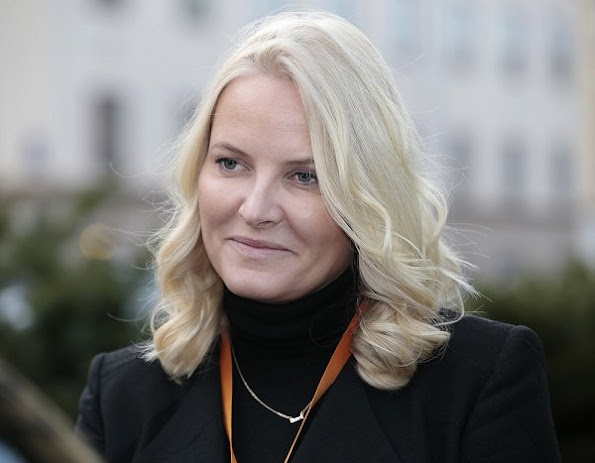 Crown Princess Mette Marit wore Chloe Fringed Jacquard Jacket and Yvonne Koné Pumps. Oh dear. The skirt is not appropriate. Something more tailored and less "party" would have been better, especially with a high necked sweater. I guess the tights will be mentioned but I think they would have worked with a different skirt. And there seems to be a brown belt in some photos that clashes with everything else. A lace skirt to a library. A PINK lace skirt ... with thick BLACK tights. DISCLAIMER FOR THOSE WHO SAY THIS IS PERSONAL ATTACK : this is not personal. It is fashion. The outfit is ugly. I do not understand her choices. I only look at her upper half now. I'm so glad that I like her so much! Ha Ha Ha, at least we know she is clean girl! Thank you, Coralie! This made my day, lol! Heather, I ask your indulgence. As a matter of fact I work for the IT-industry and so I need my little escapes from this logical world every now and then. While most of my collegues do play computergames, my escape is fashion - and fairys! Well, both can be magical! That's for her to know and everyone else to find out.... In the spirit of the - almost - Xmas season of goodwill on Earth, let's not be too critical about the inappropriate skirt and the ubiquitous ugly black hose. oh man - that skirt! Wrong colour, wrong material, wrong style, wrong length. I would have chosen an a-line knee-length skirt, either wool or velvet, even curderoy can look great, maybe dark red or dark green, or with a subtle pattern. In the royal world of fashion with women like Queen Letizia, Duchess Catherine, and Countess Sophie, this is very sad. Is there not anyone close to this Princess that can help her with her clothing? She may be a very nice person who does good work, but there is an image that should be maintained. I feel bad for her. The top part is actually not that bad. 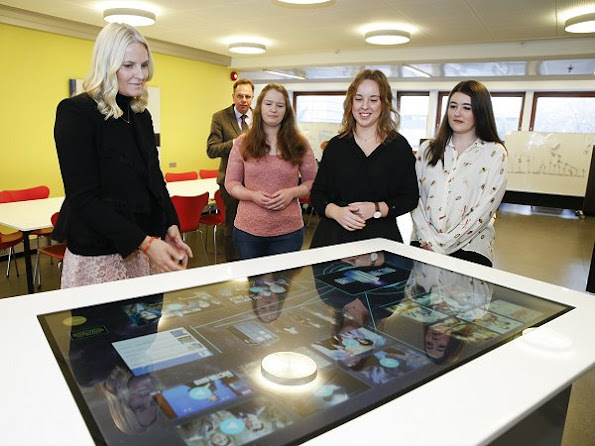 But that skirt 😮 Mette-Marit's appearance is getting more and more disturbing in my eyes. Something in this forced smile with squeezed lips tells me she is not happy. She lost all her glow. I think she needs a rest to sort herself out. Hard to believe that there is nobody there to help her. I feel bad for her too. She has pneumonia. How do you act when you are sick and have to work? Louise no one knew she was sick when this was posted. And may I say that being ill doesn't mean you dress oddly. Unless you are out of your mind. Clearly she is and was not here. 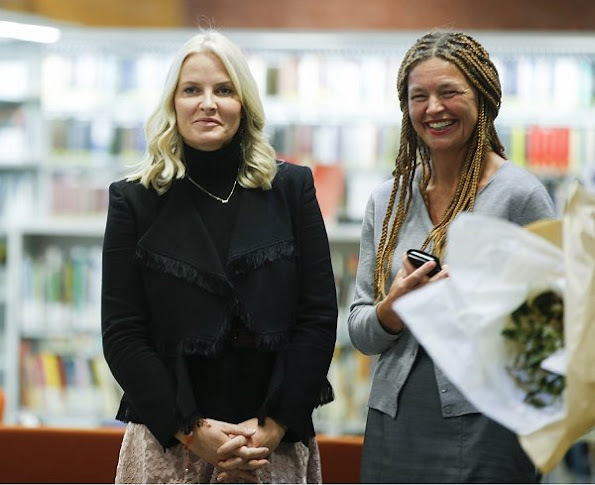 Maybe reporters ought to just ignore Mette Marit because it looks to me like she is dressing like this to spite the fashion world. She must enjoy teasing with such awful-looking outfits. She got your attention, right? Her face and hair looks especially nice in 7th photo here. Just one change would make all the difference - if she had worn, say, grey slacks ( see Letizia in the post above). I like the jacket and MM skin is as usual beautiful, but the skirt is a big "no" from me. About the skirt: 'froufrou, froufrou, par son jupon la femme, froufrou, froufrou, de l'homme trouble l'ame'. This is part of an song older than me, and I am 80. A no for the skirt ! But everything else is a yes !